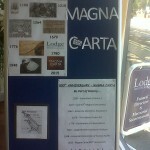 To denote and honour the significant 800th anniversary and sealing of the Magna Carta in June 1215, a timeline of events and pictures were on display in Lodge Brothers Englefield Green branch. The timeline included the year 1780 thereby heightening awareness and relevance of Lodge Brothers’ own place in history, spanning over 200 years. Leaflets and information of events taking place in nearby Thorpe and Staines-upon-Thames were available for village residents and visitors, with the display attracting much interest in St Jude’s Road. A stone’s throw from ‘The Green’ at the Royal Holloway University, a Great Charter Festival took place on Sunday 14 June 2015 featuring giant puppets. In the College Chapel, where a recent funeral conducted by ‘Lodge Brothers’ took place, around 20 Surrey flower clubs were involved in creating the flower arrangements of Magna Carta. The exhibition is open from 10am to 4pm until Tuesday (June 16).